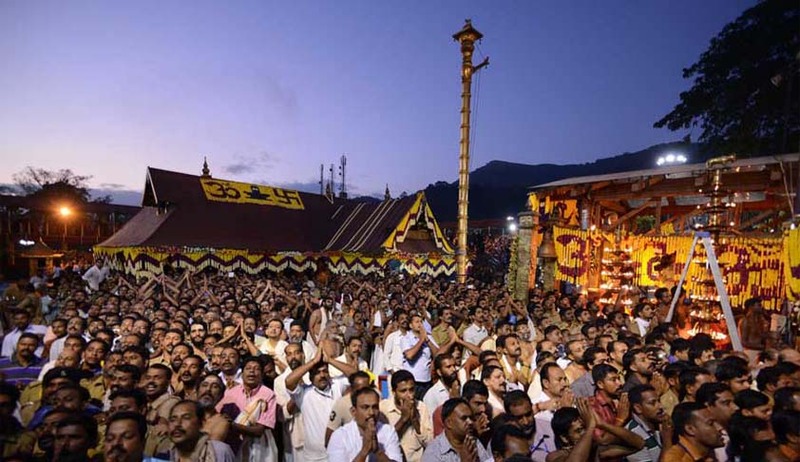 In the written submissions, the petitioner submitted that the restriction on the entry of women in the Sabarimala temple is nowhere connected with the religious practices performed there. The Supreme Court five-judge bench on Tuesday commenced hearing on the challenge to the constitutionality of the ban on entry of women in the historic Sabarimala Temple. Opening the case of the petitioners, Advocate R. K. Gupta submitted that it has been an age-old practice to restrict the access of the temple to menstruating women between the age of 10 and 50 years. He drew the attention of the bench to the judgment of a Division Bench of the High Court of Kerala in S. Mahendran v. The Secretary, Travancore Devaswom Board, upholding the practice of banning the entry of women above the age of 10 and below the age of 50 to trek the holy hills of Sabarimala for the pilgrimage. Since the present case has arisen out of 800 centuries-old tradition of prohibiting entry of women during puberty into a Lord Ayyappan Temple, in order to appreciate the legal & constitutional dimension of this tradition, Mr. Gupta sought to briefly trace the history of the temple, in context of such discrimination preached and practiced against women in all the religions of the world, particularly, the Hindu religion, on account of their physiological character related to the monthly cycle of menstruation – a productive system indispensable for evolution of man. However, the bench invited the counsel to discuss the order dated October 13, 2017, referring the matter for consideration by a constitution bench- the basis of the reference and the issues framed. After a half hour long session, the hearing was adjourned to Wednesday. (i) The religious practices performed in Sabarimala Temple at the time of ‘Puja and other religious ceremonies are not distinct and are akin to any other practice performed in any Hindu Temple. (ii) It does not have its separate administration but is administered through statutory Board constituted under Travancore-Cochin Hindu Religious Institutions Act, 1950. (iii) It is getting State funding out of Consolidated Fund of Kerela under Article 290-A of the Constitution. (iv) As per section 29A of Travancore-Cochin Hindu Religious Institutions Act, 1950, Kerala Public Service Commission appoints officers on the posts of Devaswom Administrative Service through whom Devaswom Board administrates these hundreds of Devaswom. (v) Section 29(3A) of Travancore-Cochin Hindu Religious Institutions Act, 1950, the Devaswom Commissioner is required to submit reports to the Government, once in three months, with respect to the working of the Board.". (vi) There is no exclusive follower of this temple except general Hindu followers visiting any Hindu temple. Mere attraction of some people for some temple does not make it a separate & distinct religious denomination. In this behalf, reliance has been placed on the seven-judge Bench of the apex court in the Commissioner, Hindu Religious Endowments, Madras v. Shri Lakhshmindra ThirthaSwamiar of Sri Shirur Mutt. “While giving freedom under clauses (a) & (b) of Article 26, this Hon’ble Court in Shirur Mutt case made it clear that what is protected is the essence of ‘practice’ practiced by a religious denomination. Thus, before any religious practice is examined on the touchstone of constitutional principles, it is submitted that one has to be firstly satisfied whether the said practice is in pith and substance really the ‘essence’ of said religion. Therefore, in the Sri Shirur Mutt case, this Hon’ble Court has made it clear that what is protected under Article 26(b) is only the ‘essential part’ of religion”, it has been argued. It is the position of the petitioners that the restriction on the entry of women in the Sabarimala temple is nowhere connected with the religious practices performed there. The question of it being the essence of the said religious denomination does not arise at all. The case of Sri Venkatramana Devaru & Ors. v. State of Mysore & Ors. has been cited, where it has been categorically held that the religious denomination cannot completely exclude the members of any community. They can restrict their entry in certain rituals. Justice Venkatarama Aiyar observed that the right recognized by Article 26 (b) must necessarily be subject to some limitations or regulations, and one such limitation or regulation must arise in the process of harmonizing the right conferred by Article 25(2)(b) with that protected by Article 26(b). “In the present case of the Sabarimala Temple, the restrictions on the entry of women is not the essence of the religious affairs. Even their basic religious tenets are not confined to the taking of the oath of celibacy for the period of pilgrimage as all pilgrims are allowed freely in the Temple. There is no such practice of not sighting a women during this period...The devotees worshipping Lord Ayyuppa do not go there for the purpose of the taking the oath of celibacy but for His blessings for their prosperity and well being. Maintaining celibacy during this period is only a ritual for some who want to practice the same. Even the temple administration has not given any such justification. As per them, since women, during the menstrual period, cannot trek on the very difficult mountainous terrain in the dense forest and that too for several weeks, this practice of not permitting them has started...”. The petitioner also submitted that there is no religious custom or usage in any Hindu religion specially in the same region around Pampa river to disallow women during menstrual period. On the other hand, women devotees carry the Thalappoli lamps during procession Thiruppooth Aratt festival when Mahadev and Bhargvathy images are taken in procession on decorated elephants to river Pampa for holy dip.